Ezrom Legae was educated at St Cyprians Primary School and Madibane High in Diepkloof, Soweto. He studied at the Polly Street and Jubilee Art Centres between 1959 and 1964 under Cecil Skotnes (qv.) and Sydney Kumalo (qv.). On the latter’s retirement in 1964, Legae was appointed art instructor at Jubilee Art Centre, later becoming co-director of that institution. In 1970, Legae was awarded a USSALEP travel scholarship, which funded travel and study in the US and Europe. 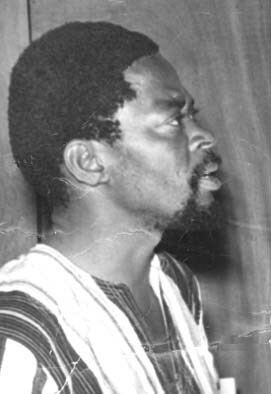 From 1972 to 1974, he was director of the art programme at the African Music and Drama Association, before leaving the educational environment to become a full-time practising artist. In 1980 and 1981, he worked as a part-time instructor at the Federated Union of Black Artists (FUBA), and was Director of the Diepmeadow Town Council Art project until his death in 1999. Perhaps more than any other artist associated with the Polly Street milieu, Legae’s practice as an artist is absolutely convincingly located at a cusp between African sensibility and reference on one hand, and the transcendent and universalist preoccupations of international modernism on the other. In this regard, many of his sculptures register equally the kind of abstractionist simplification of European and American figurative sculpture of the mid 20th century and the hieratic and animist charge and proportion of African traditional woodcarving. It is however his drawings and graphics from the 1970s on which his reputation rests most strongly today. In sustained exploration of themes like his series of conjoined animal and human forms, and his 1978 Chicken series, Legae generates an animist language of form in which the deferred and disembodied violence of representation, and evocation of primal passion and dislocated suffering, creates images that are memorably adequate in iconising the political consciousness of the times. Born Vrededorp, Johannesburg, 1939: died Soweto, 1999. Training 1959–1964: Studied at the Polly Street and Jubilee Art Centres under Cecil Skotnes (qv.) and Sydney Kumalo (qv.). 1970: Awarded a USSALEP travel scholarship for travel and study in the US and Europe. Exhibitions 1966: Solo Exhibition, Egon Guenther Gallery, Johannesburg; SA Breweries Prize Exhibition; Republic Festival Art Exhibition, Pretoria. 1967: Art SA Today, Durban Art Museum. 1968: Transvaal Academy, Johannesburg. 1971: SA Graphic Art, Holland, Belgium, The Netherlands. 1972: Republic Festival art exhibition, Pretoria. 1974: African Art, National Arts Society, Johannesburg; Contemporary African Art, United States Information Services, Johannesburg. 1977: World Wilderness Congress, Johannesburg. 1978: Solo exhibition, Chicken Series, Goodman Gallery, Johannesburg. 1979: Contemporary African Art in SA, travelling; Valparaiso Biennale, Chile. 1980: Sculpture 80, University of South Africa, Pretoria. 1981: Black Art Today, Jabulani Standard Bank, Soweto.1982-3: Kunst aus Südafrika, travelling show to West Germany. 1985: Tributaries, Africana Museum, Johannesburg, touring South Africa and West Germany; Group Show with Cecil Skotnes, Sydney Kumalo and Eduardo Villa, Goodman Gallery, Johannesburg; Amadlozi Exhibition, New York, USA. 1986–7: Johannesburg Art and Artists: Selections from a Century, Johannesburg Art Gallery. Awards 1967: Art SA Today (Oppenheimer Sculpture Prize) 1968: Transvaal Academy (Merit Award) 1979: Valparaiso Biennale (Honourable Mention) Collections Durban Art Museum; Johannesburg Art Gallery; Pretoria Art Museum; South African National Gallery, Cape Town; De Beers Centenary Art Gallery, University of Fort Hare, Alice; Tatham Art Gallery, Pietermaritzburg; UNISA Art Gallery, Pretoria; Pelmama Collection; William Humphreys Art Gallery, Kimberley; University of the Witwatersrand, Johannesburg.